In short, Agility is a sport in which a dog runs through a timed obstacle course under the guidance of the handler. Agility training strengthens the bond between dog and handler, and provides fun and exercise for both. Where it Began - The idea of agility was born in 1977 when Crufts Dog Show needed something to fill up spare time in the main arena between the end of the obedience championships and the start of the group breed judging. Various dog training demonstrations were held over the years, some of which included dog jumping. The new demonstration had to be a nice to see test and it should be suited to the hard Olympia floor. The main idea of a dog jumping competition is based on the show jumping of horses. Some people put their heads together and they came out with a test based on vast practical dog training knowledge and experience in working trials. Main factors that had to be kept in mind were : that it should be fun, without being dangerous and it should have to amuse spectators. They built the equipment. Another club was contacted to form a second team of four dogs and they all helped each other with training ideas and modifications to equipment. And so the base was laid for the agility we know now. Today, Agility enjoys enormous popularity in Britain, with well-attended competitions every weekend during the show season. The larger events draw thousands of competitors and attract huge, appreciative audiences - many competitions are now even televised. This enthusiasm for Agility has spread to virtually all of Europe, as well as Australia and New Zealand, followed by the USA in 1986, making Agility a truly international dog sport. Dog agility has changed a lot over the years since those humble beginnings at Crufts, with many organisations and governing bodies regulating and overseeing the sport in many countries, each with their own view of what agility is, or should be. There is, however, one aspect of dog agility that has not changed, and should never change, that precious relationship developed with your dog through having a "fun" dog sport to train and compete in. Agility in Canada - Agility roots were planted in Canada by our own Art Newman, of North Gower, Ontario, in 1988, with the founding of the Agility Dog Association of Canada (Now called the Agility Association of Canada - AAC). Agility clubs are now firmly established in all major centres in Canada, and many smaller outlying areas. Below is an example of a Fun Course. For an official starters course the trial Judge is responsible for the course design. The Chief Builder and the Ring Stewards are responsible for the actual layout and building the course. When the course is built the Judge will check it, measure the distance between obstacles, and the overall course distance. They will have the course adjusted as needed. Agility puppy training can start with dogs as young as 4 to 5 months! Granted, it doesn't really LOOK like agility at first. There's a lot of playing and silliness - but really, at any level of training, isn't that what agility should be for our dogs? FUN! Puppy agility NEVER physically stresses little puppy bones; so our young dogs don't do any real jumping. They step over small cavaletties that are only a couple of inches off the ground. We do a lot of target work to teach them to work away at a young age. Target work also helps our puppies to have excellent contact control! Puppies LOVE running through the tunnels (usually chasing each other or a ball!). To train any dog you must first get his attention and the best way of doing this is with a toy and a game of Tug-of-war where you become an integral part of his pleasure. This teamwork developed in play can then be extended to working. Puppies are so eager to learn and so happy to please. They really pick things up quickly. But the key to a successful training session is to keep the lessons SHORT and POSITIVE. We also employ lots of rewards, from special food treats to toys and games (and lots of hugs). Once a puppy figures out an obstacle, they've GOT IT! When training a dog there is a danger of concentrating on commands and corrections, forgetting the most important praise and reward. In Agility training there is no place for training by compulsion - build your dog's confidence by the use of encouragement, praise and reward. And agility training works WONDERS for improving confidence in a shy puppy. The other huge benefit is the socialization these puppies are getting with each other; in fact, I think they look forward to the play sessions the most! The best way to train your dog is by joining a local dog training class and train basic obedience when your puppy is four to eight months old. Train him gently with plenty of praise until he understands what is required of him, build up his confidence, never run out of patience because what you want is control of your dog. Never make him jump an obstacle or do something he doesn't understand or is unable to do, a young dog's bones must have time to grow and develop. Only start Agility training when there bones are mature enough to handle it. Usually around 12 months old for smaller breeds and 18 months old for the larger breeds. A dog's working life could be ruined and shortened if agility training is started too early or rushed. When your dog is over 12 months start hurdle training, you can do this in your back garden or in the local park using small portable jumps which can be made simply and at little expense. 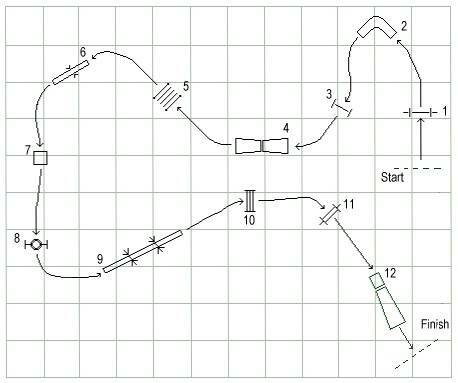 Standard - courses must include jumps, all 3 contact obstacles, weave poles, the table, the flexible tunnel and chute. The number of obstacles increases with the level of competition. It demonstrates the overall ability of the dogs to perform all the obstacles. Gamblers - the object of Gamblers is to successfully complete as many obstacles as possible within a set time allowed in an opening sequence. The obstacles each receive a different point value, common values are jumps, 1 point, tire and tunnels are 2 points, contact 3 points, weave 3 to 5 points. The opening sequence expires with blow of a whistle, at which point the handler has a shorter set time to complete a closing sequence. This final sequence or "gamble" must be done with the handler remaining outside a prescribed area usually outlined with rope or tape and within the time allowed. A required number of points are required, in addition to the successful completion of the gamble within time for a leg to be earned. Gamblers: Requires a little bit of distance handling, but in Novice, the distance obstacles will not include weaves or the teeter – usually tunnels, jumps, and maybe the A-frame. Jumpers - is composed of jumps, tires, tunnels, and chutes. This game is probably the most popular event by many competitor and spectators alike. It involves excellent handling skills and real team-work. The pace is fast and furious with twisted flows and potential chances for off course penalties at every turn. There is no reason not to enter this class early on in your competitive career. Team Relay (2,3 or 4 dogs) - designed to demonstrate team spirit, strategy and sportsmanship. Relay involves a course layout similar to standard agility. The course is divided in sections. All team members must run clean and under the time allowed to earn a qualifying leg. Failure to pass the baton in the specified area results in elimination. This is run as a relay – the first dog/handler run half of the course, pass a baton to the second team, who finish the second half of the course. You can enter with someone you know or get matched up by draw. At the Novice level, everybody is in it for fun and nobody really cares if something goes wrong in your half of the run, so don’t hesitate to enter. Snooker - is base on the British game of Billiards. There are two separate sequences. The opening sequence requires the handler to perform one of 3 or 4 designated (red) jumps followed by an obstacle of choice, and repeat this pattern at least twice more, a third time is an option left to the judges discretion and outlined in the briefing. The closing sequence requires the dog to follow the obstacles numbered 2 to 7. The game is based on points accumulated and as long as the dog has reached or surpassed the required point level, a qualifying score will be earned. One of the most complex games. Starters, Advanced and Masters levels are sanctioned by the Agility Association of Canada. The level of difficulty increases substantially with each level.